Sinusitis is one of the most common health problems and more prevalent than heart disease and cancer. It has a greater impact on quality of life than chronic back pain or asthma. The sinuses are hollow spaces in the skull, namely the frontal, ethmoid, sphenoid and maxillary sinuses, which serve to lighten the skull and give resonance to the voice. The purpose of the sinuses, which open into the nasal cavity, is to generate mucus to keep the nose from drying out during breathing and to trap unwanted materials so that they do not reach the lungs. Each sinus has an opening that allows mucus to drain – this drainage is essential to keep your sinuses working well. Anything that obstructs that flow may cause a buildup of mucus and lead to a sinus infection. Sinusitis occurs when the linings of your nose, sinuses and throat are inflamed, possibly from a preexisting cold or allergy. Chronic sinusitis is when this inflammation lasts three months or more. If your symptoms do not resolve with medication, or if you experience symptoms for longer than 12 weeks, you could have chronic sinusitis. Chronic sinusitis treatment aims to lessen or eliminate the symptoms caused by inflamed or blocked sinuses. An ENT doctor is qualified to diagnose chronic sinusitis and determine the best sinusitis treatment options for you. Sinusitis can be treated nonsurgically with simple therapy, such as inhaling steam or using saline nasal sprays. An ENT doctor may prescribe antibiotics or nasal steroid sprays. However, clinical studies show up to 60% of sinusitis sufferers do not get relief with medication. For patients who do not respond adequately to medications, an ENT doctor may recommend sinus surgery. Traditional sinus surgery removes bone and tissue to enlarge the sinus opening with the aim of clearing blocked sinuses and restoring normal sinus drainage. With sinus surgery recovery is often associated with pain and scarring. Balloon Sinuplasty is a breakthrough, minimally invasive procedure that ENT doctors use to treat chronic sinusitis. A tiny balloon is placed into the nose to reach the blocked sinuses and then inflated to widen the sinus opening. The procedure is safe, effective and recovery is quick. 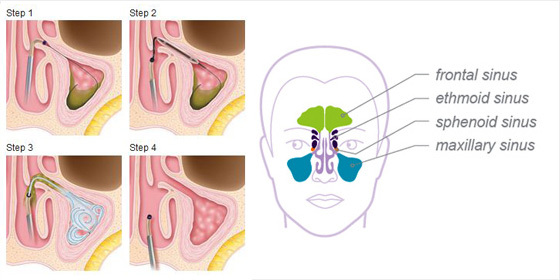 Balloon Sinuplasty is a minimally invasive procedure that opens up sinus passages. It relieves the pain and pressure associated with chronic sinusitis. Balloon Sinuplasty is available to some patients as a procedure conducted in a doctor's office under local anaesthesia. Balloon Sinuplasty is less invasive than traditional surgery with minimal bleeding and minimal postoperative pain. Also, preliminary results from recent studies indicate that opening a sinus using Balloon Sinuplasty in children has an excellent safety profile and may be an effective treatment option for blocked maxillary sinuses. It relieves the pain and pressure associated with chronic sinusitis, without cutting and removing the natural structures in the nose. Tens of thousands of patients have experienced long term improvement in their quality of life after Balloon Sinuplasty procedure. While recovery time varies with each patient, many people quickly return to normal activities. How Long Does The Balloon Sinuplasty Procedure Take ? Since the duration of the procedure varies, ask your ENT doctor for the most accurate answer. However, in a study of more than 1,000 patients, the average procedure time in the operating room was 73 minutes. None of the patients required an overnight stay at the hospital. Typically patients go home the same day that they have the procedure. While recovery time will vary from patient to patient, many people can quickly return to normal activities. Is The Effect Of This Procedure Permanent Or Might I Have To Undergo Repeated Procedures ? Is Balloon Sinuplasty Cleared For Use By The Us Fda ? Balloon Sinuplasty received US FDA clearance in 2005. Over 150,000 patients have had the procedure. Clinical studies have shown that Balloon Sinuplasty is safe, minimally invasive, and significantly improves quality of life. Clinical research confirms that Balloon Sinuplasty provides long-term relief from sinus symptoms by effectively opening blocked sinus passageways. Is Balloon Sinuplasty Right For Me ? It is important to talk to your ENT doctor about all of your sinus treatment options and ask what type of therapy is best for you. If you suffer from chronic sinusitis, and medications have not been effective in relieving your symptoms, you may be a candidate for Balloon Sinuplasty.